Switching from incandescent to LED bulbs can cut the amount of electricity a lamp consumes by sixty percent or more. But with their cool-white hue and hefty price tag, getting excited about these earth-friendly lights can be hard. At design events taking place around Tokyo this week, exhibitors played up the benefits of LEDs—like the fact that they are small, emit little heat, and can be easily dimmed—with a selection of innovative fixtures. Here's what I saw. 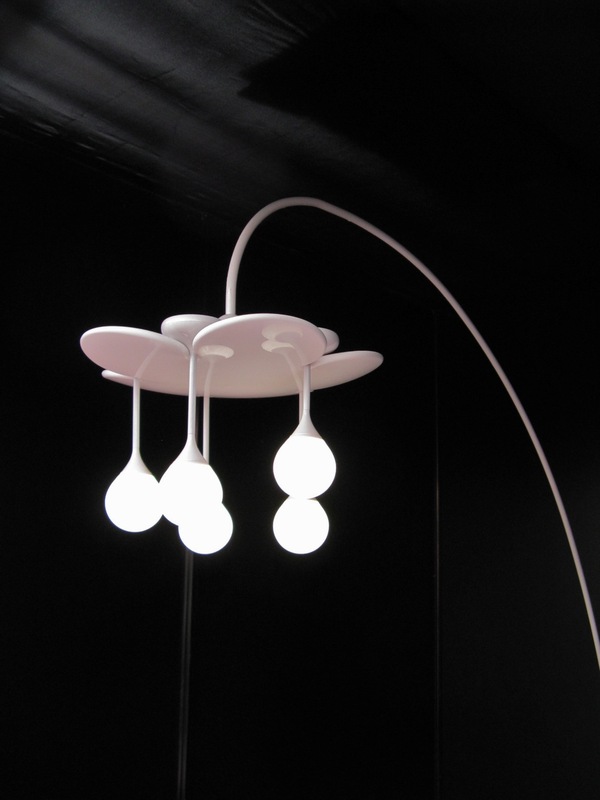 Drop Lights by South Korean product-development company DOOlight recharge by resting on their flower-shaped base. The individual 6-Watt “drops” can be slipped off and used for two to ten hours without plugging in; brightness is adjusted by touching the stem or base. Because the bulbs are made of silicone and don’t heat up, they’d work well in a kid’s room. The (environmentally-friendly) spotlight is on you with this swiveling MARU Spot prototype by Seiji Ishida and Yoko Naito of Saitama-based LIGHTSCENE inc.. LEDs emit a more focused light than incandescent bulbs, which makes them a perfect fit for this design. I spied this Coral Reef desk lamp, out earlier this year from Taiwan-based QisDesign, for sale at Mid-Century Modern, a funky little shop in Tokyo’s Aoyama district. Brightness is adjusted with a tap on the stand, and the angle of the ocean-inspired LED light can be easily changed as well. For those situations in which nothing but a good old-fashioned light bulb will do, this LED Nostalgic Clear Type lamp from Panasonic should do the trick. The bulb scatters light in all directions and gives off a warm glow, just like those energy-sucking incandescent bulbs we grew up with. It won a 2011 Good Design Award and has place of honor through November 13th at the Good Design Exhibition in the Design Hub gallery at Tokyo Midtown Tower.